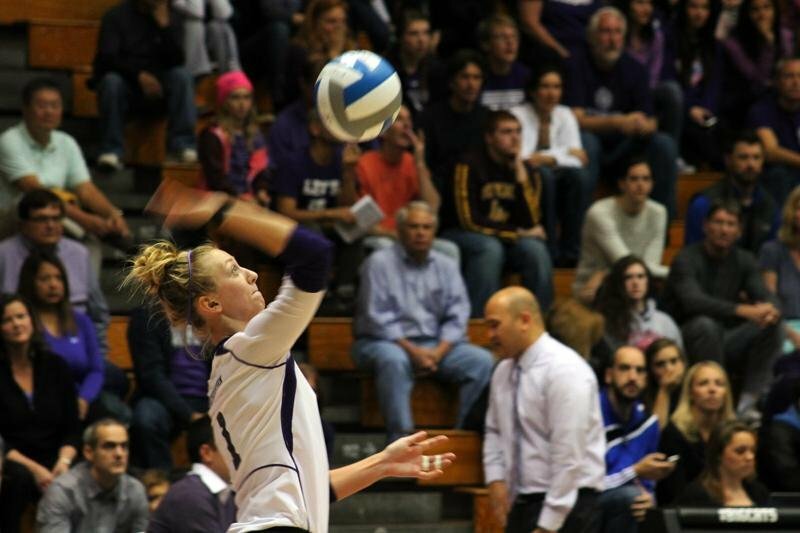 Senior Stephanie Holthus serves in the NU’s game against No. 4 Penn State on Sunday. The Cats lost 3-0, ending their three-game winning streak despite a team-best 13 kills from Holthus. Northwestern arrived on its home court Sunday afternoon as the winner of three straight contests. Two of these matches came against top-20 foes, forming a strong run of play in the heart of Big Ten season. Apparently, Penn State didn’t care. The Nittany Lions (16-2, 7-1 Big Ten) defeated the Wildcats (12-8, 4-4) in three sets at Welsh-Ryan Arena on Sunday, swiftly killing NU’s bid for a fourth-consecutive victory. It was another banner day for the then-No. 4 team in the nation, as Penn State won its seventh straight Big Ten match after losing its conference opener. On the other side, the Cats failed to live up to their potential, as the team never seriously threatened to win any stanza down the stretch. Coming four days after taking down then-No. 17 Ohio State in four sets, this was quite the perplexing result. Is Penn State an insurmountable powerhouse, or did NU play a really sloppy match? For coach Keylor Chan, both played a hand in the loss. Early on in the first set, the match appeared it might be quite the battle. The two squads waged a fierce fight over the initial 12 points of the contest, as the duo combined for nine kills and three lead changes in a 6-6 beginning to the opening set. From there, though, Penn State asserted its dominance. The Nittany Lions scored 12 of the next 18 points and cruised to a 25-17 victory. The following two sets didn’t start off nearly as close, allowing the visitors to defeat the Cats by scores of 25-15 and 25-17. Penn State’s varied offensive attack gave NU fits all night, as it produced a healthy 14.0 kills per set at a highly effective .385 rate. Outside hitter Nia Grant was especially potent, capitalizing on 11 of her 13 attacks against one error. Penn State’s offense didn’t just affect NU’s coach. Libero Caroline Niedospial produced 41 digs in her last nine sets coming into this match, putting on two dazzling defensive displays in aiding the Cats to victories over ranked opponents. Against the Nittany Lions, Niedospial failed to cobble together the same defensive firepower, pounding out a mere 10 digs in three sets. For the redshirt sophomore, the highly-touted visitors brought an offense the Cats couldn’t keep up with on an off night. As for NU’s offense, the team started off hot with 13 kills in the first set, an impressive mark considering Penn State had been holding opponents to 10.3 kills per set. Yet in the final two stanzas, the Cats mustered a combined 18 kills and were blocked nine times by the Nittany Lions’ front court. Outside hitter Kayla Morin said the attack performed admirably Sunday, but that blocking, along with Penn State’s serving, wrecked havoc. This match was a blemish in an overall fantastic 10 days for NU. What is there to do after this disappointing defeat? Simply look to the next match.